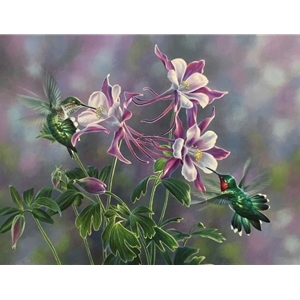 I spent days and weeks gradually adding details and slight variations of colors and honing my skills on capturing the wing beats of these beautiful iridescent birds. My mom used to feed hummingbirds all the time. I would sit in amazement as they darted around taking sips of nectar. Can you believe these birds can beat their wings around 50 times per second? Gods creations never cease to amaze me!